Metrolinx’s Transit Procurement Initiative (TPI) is pleased to release its 5th Annual Report. 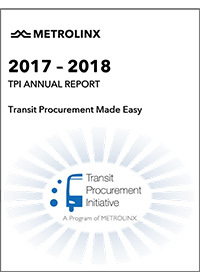 The report offers an overview of our program achievements and showcases TPI’s ongoing commitment to deliver joint procurement initiatives to Transit Agencies across Ontario. The results are clear, TPI's joint procurement initiatives, a program of Metrolinx, helps Ontario municipalities maximize transit dollars and achieve best value for taxpayers money. We invite you to review our 2017-2018 TPI Annual Report. Please contact TPI should you wish to discuss TPI’s program opportunities.